House removals to Spain can be both daunting and exciting, and of course there is a lot to get done before the big removals day itself. One important thing to do is to sell your English property and buy or rent your Spanish one. This way, you know you have a base to move to. But what happens if your Spanish home isn�t ready for you when your removal date comes? This can happen to anyone during removals to Spain, whether they are renting or buying. Delays in the Spanish legal system or simply a mismatch on timings can easily mean that you will need to move into temporary accommodation once you reach your Spanish city. Hopefully the wait won�t be too long, and you can either stay in a hotel, or perhaps even rent a small apartment for the few weeks that it will ideally take. If you are having a home built in Spain, it could take longer. Whatever the reason, you will most likely not be able to take all of your possessions with you to the temporary home, as, for the sake of your budget, it will probably have to be smaller than the property you will eventually move into. 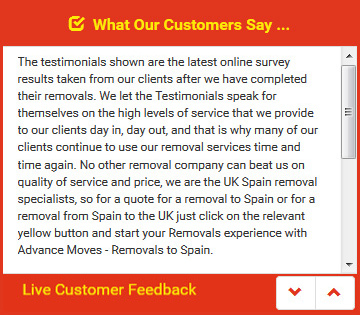 Therefore, when organising removals to Spain from UK it is a good idea to use a removals company that has storage facilities in Spain itself. This way, your belongings will be in the country you intend to live in, and they will be safe and secure until you are ready to move into your permanent home. Advance Moves are the friendly, professional, expert team you need for house removals to Spain. Our website (http://www.advancemoves.com/) has a wealth of information as well as a quick quote system. Alternatively, contact us on 0871 218 0612 (from the UK) or email info@advancemoves.com with any questions. We will be happy to help.